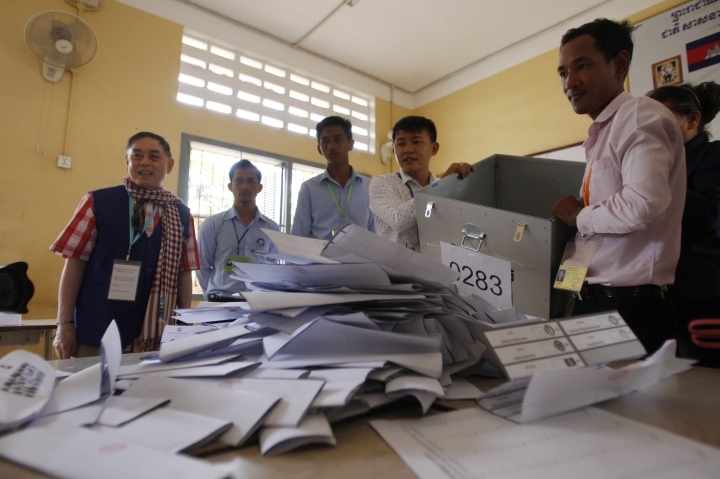 The U.S. government says it regrets that Cambodia's election was flawed and will consider its responses to the outcome and other setbacks to democracy and human rights in the Southeast Asian country. 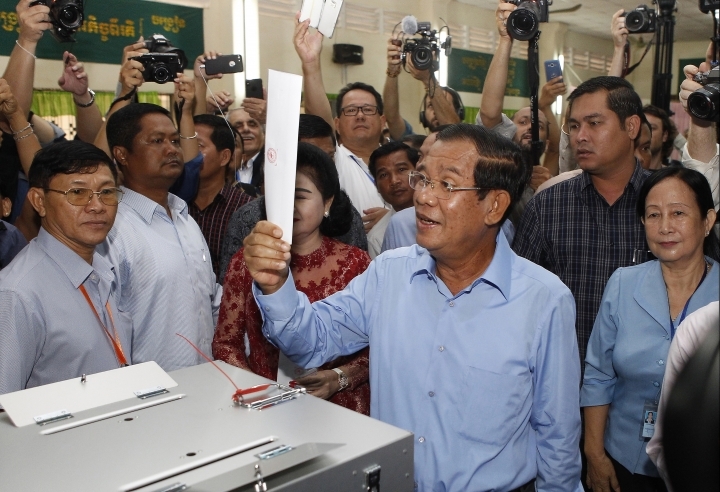 The long-ruling party of Prime Minister Hun Sen won Sunday's vote in a widely expected result after the only credible opposition party was dissolved last year by a court ruling. The statement from the White House press secretary's office cited the exclusion of the Cambodia National Rescue Party, restrictions on activists, and threats against non-voters as setbacks to democracy and a disenfranchisement of voters. It said the U.S. would consider measures including expanding on visa restrictions that were announced in December. Cambodian exiles have argued for travel bans on top Cambodian officials, a move intended to punish the leaders without hurting the Cambodian people. Australia's foreign minister says her government had told the Cambodian government of its serious concerns about Sunday's election. Cambodia's ruling party won in a widely expected result after the only credible opposition was silenced. Foreign Minister Julie Bishop says in a statement: "The election process, which has included the dissolution of the Cambodia National Rescue Party (CNRP), the detention of CNRP leader Kem Sokha, and the banning of CNRP parliamentarians and officials from engaging in politics for five years, has reversed more than 25 years of progress towards democracy in Cambodia." She adds: "Australia is concerned the election took place in an environment where not all political parties, civil society organizations and media could operate freely." She says Australia will continue to urge the Cambodian government to take steps to allow free and open political debate without violence and intimidation. Cambodia's exiled opposition leader Sam Rainsy has called for peaceful protests against the country's general election, calling it "a sham election with a foregone conclusion." Cambodia's information minister says the ruling party won Sunday's election, ensuring that Prime Minister Hun Sen, who has led the country for 33 years, will serve another five year-term. Sam Rainsy, speaking roughly 180 kilometers (112 miles) south of Paris in Freteval, where he lives, told The Associated Press that "it is a meaningless victory because he won without any real challenger ... prior to the election he dissolved the only credible opposition party." Although 20 parties contested the election, the only one with the popularity and organization to mount a credible challenge, Sam Rainsy's Cambodian National Rescue Party, was dissolved last year by the Supreme Court. This item has been corrected to show Rainsy was speaking in Freteval, not Paris. Cambodia's chief government spokesman says the country's ruling party has won the general election, ensuring that Prime Minister Hun Sen, who has led the country for 33 years, will serve another five year-term. Khieu Kanharith, who is also information minister, did not say how many of the 125 seats in the National Assembly the Cambodia People's Party had captured in Sunday's election, but preliminary totals broadcast on state television showed that it had won at least 70 percent of the vote in each of the country's 25 provinces. Although 20 parties contested the election, the only one with the popularity and organization to mount a credible challenge, the Cambodian National Rescue Party, was dissolved last year by the Supreme Court. Preliminary partial vote counts from Cambodia's national election show Prime Minister Hun Sen's ruling party well on its way to victory as expected for almost all of the 125 National Assembly seats, with the longtime leader on the verge of returning for another five-year term. Although 20 parties contested the election, the only one with the popularity and organization to mount a credible challenge, the Cambodian National Rescue Party, was dissolved last year by the Supreme Court. Local and foreign rights groups, along with several Western governments, had agreed that the polls would not be credible. Sunday night's initial tallies, which were broadcast live on state television, showed Hun Sen's Cambodia People's Party with at least 70 percent of the vote in all 25 provinces, with the 19 challenger parties far behind. 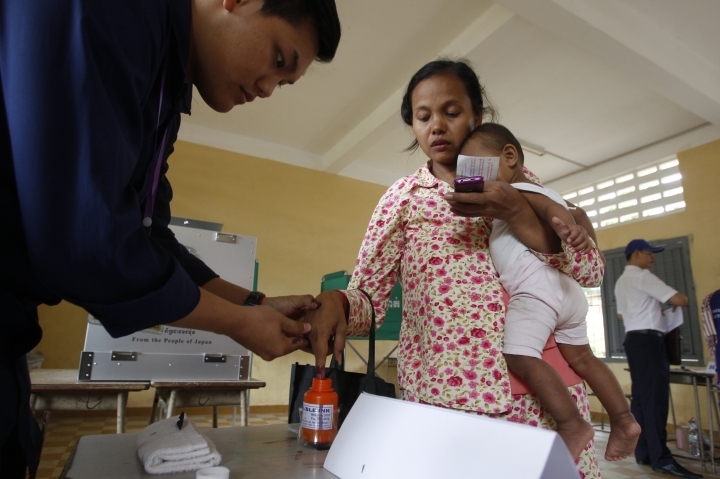 Cambodians have begun voting in an election virtually certain to return to office Prime Minister Hun Sen and his ruling Cambodian People's Party. Although 20 parties are contesting the polls, the only one with the popularity and organization to mount a credible challenge, the Cambodian National Rescue Party, was dissolved last year by the Supreme Court. Its former leaders have called on supporters to boycott the polls. Voting ends at 3 p.m. and preliminary results are expected on Sunday night. Copyright © 2015 - 2019 VNReporter. All Rights Reserved. VNReporter is built to serve the people of Vietnam exclusive reports that best reflect the happenings and achievements in the country. With the rise in the popularity in online news, readers now demand to read quality news in a more modern and easy to read format.